Arteesol Team has come to dedicate time and energy to arouse people's passion for adventures and sports. A MUST Have for Water Sports Enthusiast! Assorted Sizes - The waterproof bags have 4 sizes (5L 10L 20L 30L) and 4 colours. Large capacity to contain more of your gears. The extra pocket in front can contain some stuff like cell phone, wallet or keys, which may come to your first aid. 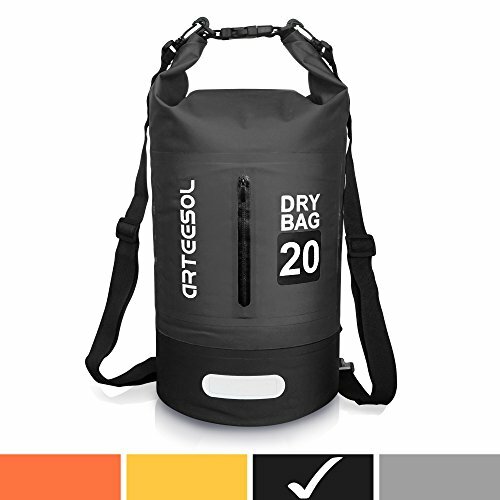 Special Design - The dry bag rucksack features 2 adjustable shoulder straps and buckles to make it easy to carry. You can use it as a large volume backpack and free your hands when you go cycling or climbing. Ultra Durable - The whole bag is made from PVC waterproof fabric, better air tightness and waterproof performance. Perfect for boating, swimming, kayaking, rafting, floating, travelling, cycling and other outdoor activities. Important - Please note that to ensure a better seal, tightly roll down the seal 3 or 4 times ad clasp the buckle. We recommend you to put your electronic devices into a waterproof pouch to multiply protect your gear. If you have any questions about this product by Arteesol, contact us by completing and submitting the form below. If you are looking for a specif part number, please include it with your message.